This compact, lightweight machine can aerify to a depth of 10 inches (250 mm), leaving a smooth playing surface. 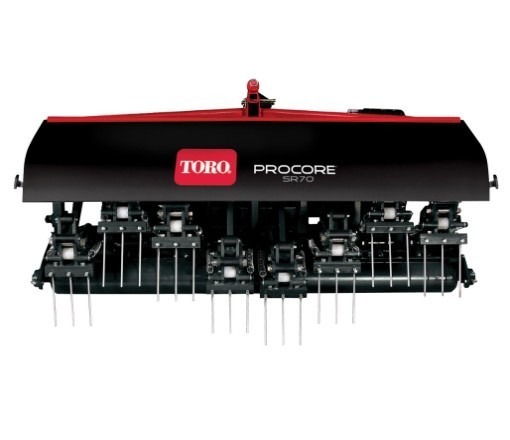 The SR70 produces a `soft touch` and is the ideal machine for aerifying at a deep level, quickly and efficiently. There are multiple positions available to adjust the soil fracturing movement of the tines. This allows you to adjust and control this motion to your desired application. There are many coring and solid tines available to cover a wide variety of cultivation practices. The distinctive frame construction incorporates perfectly aligned arcs following the movement of the crank arms and the movement of the main frame. This design allows the operator to change the tine depth without changing the angle of entry by using the hydraulic top link from the tractor while the machine is in operation. 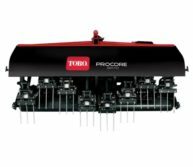 Because of this one-of-a-kind feature, you can apply the ideal tine position for every soil type and condition, without leaving your seat. All of the deep-tine models use a standard 3-point tractor hook-up and are powered from the tractor’s PTO. These robust machines are capable of withstanding extreme aeration conditions. The heavy-duty design includes an oversized gearbox, heavy-duty bearings, crank arms and chains, allowing you to operate in the toughest conditions. The crankshaft, tine arms and frame are perfectly aligned allowing for superior performance and long life. With its fast, efficient performance and innovative design, the deep-tine aerators are able to run smoothly at all depths, relieving pressure-packed soil with superior hole quality. The leverage of the aerator allows the weight to be placed directly over the point of impact, enabling lightweight units to do heavyweight jobs while reducing shock and wear and tear on the machines.